Over three weeks ago we noted that Windows Phone Market Place passed 40,000 apps. It’s now at 45,000. Not bad. With the new wave of Mango Windows Phones from other manufacturers and of course, Nokia’s forceful arrival, developers are showing growing interest and support in the platform. AllAboutWindowsPhone expects 50,000 to be reached by the first week of January. Of course we don’t care so much about the amount of apps (and hence noise) but the amount of quality applications and thankfully Market Place does have this in abundance. I just wanted to note that unfortunately the lumiappaday series is defined not by apps I want to show off but apps I like and used, e.g. the Shopping list app worked well for me though it was simple, but there were much more impressive ones (like one that could find local stores, local prices, sort out what isles those items are actually in, etc). 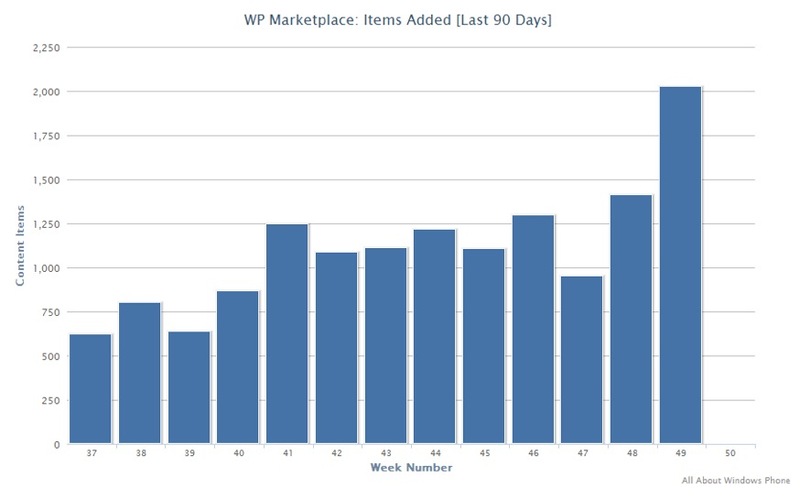 If there’s no growth and theres static increase of about 5k growth in a month, by October-November next year, WP Market Place would reach 100,000 mark. Next year however, Nokia will be pushing Windows Phone in volume and Microsoft will be releasing Windows 8 tablets that will get people into the Metro line of thinking. Thanks Viipottaja for the tip!